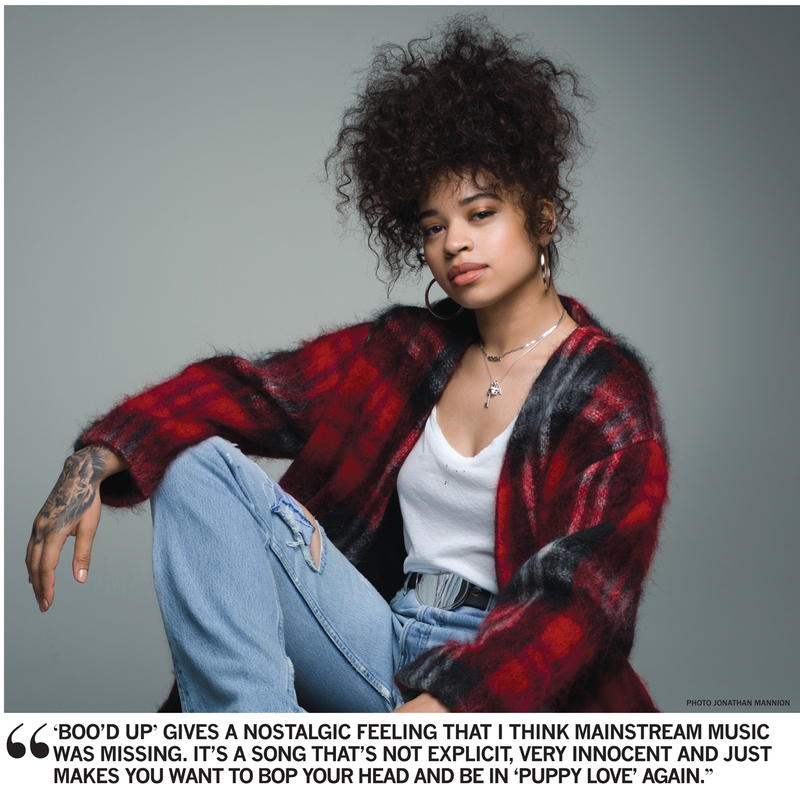 Deftly blending elements of classic soul and modern R&B, 23-year-old Ella Mai (surname: Howell), a half-Jamaican/half-Irish Londoner—and a New & Developing Artist selection earlier this year—scored a surprise #1 on the U.S. R&B charts with the smoky ballad “Boo’d Up” after signing with Mustard’s 10 Summers imprint through Interscope. The timeless-sounding hit, which is on Ella Mai’s newly released, self-titled debut album, has a shot at a Grammy nomination for either the Best R&B Performance or Best Traditional R&B Performance. More significantly, is there a Best New Artist nom in the offing? Your debut album is here, and you’ve talked about the positivity of not being rushed in recording it. Who or what was the greatest creative influence on you when making this record, and why? I had a lot of influences when making the album, but I honestly feel like I was the biggest influence, if that makes any sense. I really had to reflect on my life and who I am as a person. I really dug deep and thought about what I stand for when making this album. So I’d have to say my life was the biggest influence. What bonds you to a song that makes you instinctually feel, “OK, this one is special”? Normally, if I feel it from the jump, from the chords to when we’ve got the melody and don’t have lyrics yet, then I know [it’s special]. There’s a feeling behind it. I felt like that with almost every song on the album. The ones I felt the most were “Dangerous” and “Close.” I felt those instantly when I heard the chords and the beat and when we did the melody. Overall, it’s a feeling you can’t really describe, but you know. Some of your very first key connections—like with Mustard—happened over Instagram. In what ways has social media transformed the game for aspiring artists? I think social media has eliminated the middle man and given people a platform to express themselves and whatever it is that they do more freely. It takes away the guidelines of someone telling you what you can or cannot do. It’s an easier way to get noticed, because everyone uses social media. What is your secret sauce with “Boo’d Up” that keeps everyone leaning on the repeat button? “Boo’d Up” gives a nostalgic feeling that I think mainstream music was missing. It’s a song that’s not explicit, very innocent and just makes you want to bop your head and be in “puppy love” again. Being a U.K. artist, what significance does the Grammy Awards hold for you personally? I think being from wherever in the world, the Grammys are the biggest recognition you can get as a musician. Being that the Grammys are not in England, to be nominated or to win a Grammy when you’re not from the same country would be very special. It would be a high honor and show the English industry and market that there is a mainstream market for R&B. You’ve mentioned growing up listening to your mom jam Lauryn Hill and Mary J. Blige music nonstop; did you two ever watch the Grammy Awards from across the pond? We sure did! I would always watch the Grammys. As I said earlier, it’s the highest recognition for a musician, and I would always tune in. And yes, I still watch it today.